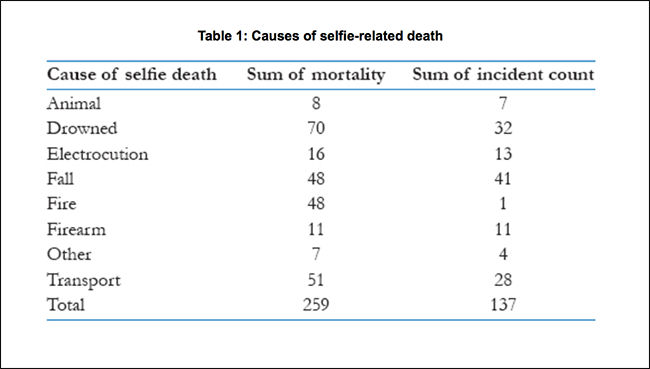 A recent study found selfies were a factor in 259 deaths between October 2011 and November 2018. 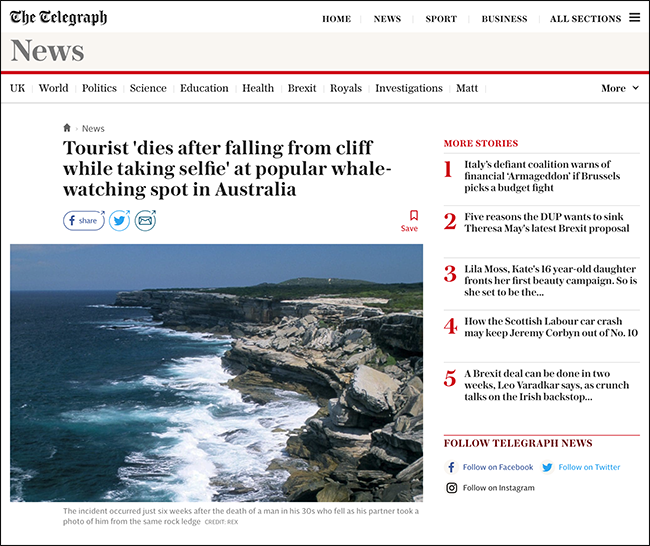 This number is almost certainly too low as it’s based only on reports of deaths in English language media; it doesn’t include near deaths, serious injuries, deaths reported in non-English media, or deaths where selfies weren’t mentioned even though they might have been a factor, such as car crashes. In other words, lots and lots of people are dying or getting hurt taking selfies. The study found that most people died by drowning, falling, burning, or getting hit by a moving vehicle—though animal attacks, firearm deaths, and electrocution appear on the list, too. 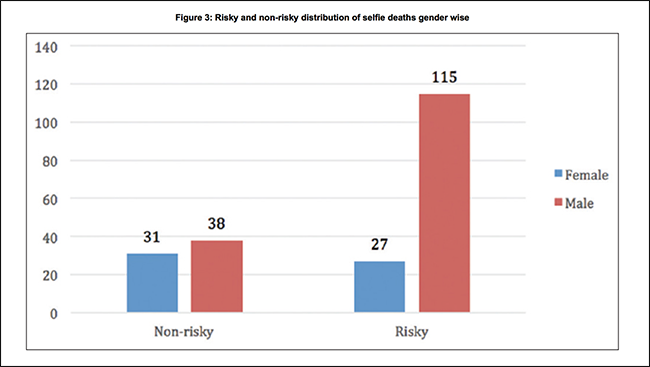 Surprising no one, more men died than women while engaging in “risky” selfie behavior. Today, we’re not concerned with how to take a good selfie—we’ve covered that before—instead, we’re going to talk about how to do it safely. Because apparently, this is a conversation that needs to be had. More than anything, the leading cause of “selficide” is being unaware of your surroundings. Whether someone steps off a cliff by accident or capsizes their boat and drowns, it’s because they’re too focused on taking a selfie and not on where they’re standing and what’s going on around them. I’m going to buck the judgemental tone of a lot of articles here. Standing close to the edge of a cliff or climbing some rocks can be an entirely risk-managed activity if you keep in mind where you are and what you’re doing. The key is to make sure you are secure before you even think about taking out your phone for that selfie. You should not wander backward aimlessly while looking at yourself in your screen, even if there isn’t a cliff behind you. A small trip can be enough for a serious head injury. Similarly, if the waves are small and you’re a strong swimmer, you can stand closer to a pier or take more risks in a boat. On the other hand, if you can’t swim or the waves are big, you should not be near the water. To me, the most ridiculous statistic on the list were the eight people who were mauled to death by animals. We don’t call wild animals wild because they rip up the dancefloor until 5am on a Saturday night; we call them wild because they are literally untamed, unpredictable, and quite possibly capable of tearing you limb from limb. Wandering up to a bear, elephant, or walrus and trying to get it to pop blue steal with you is just asking for trouble. Firstly, animals can’t pose and are generally terrible at looking at the camera (as your cat demonstrates every time you try to take its picture), and secondly, these ANIMALS CAN KILL YOU. Even if you’re not planning on taking selfies, seriously, just avoid wild animals. Getting hit by a moving vehicle, especially a train, is another especially common cause of selficide. People forget that a relatively modest 60 miles per hour is still 88 feet per second. They think they have enough time to step on to the train tracks and snap a selfie, but they absolutely don’t. It’s the same with highways and even bike paths. Vehicles move fast in a straight line. In a few seconds, they can go from hidden around a corner to six inches away from killing you. Seriously, don’t stand anywhere a vehicle could appear quickly and never stand on train tracks; they might also be electrified. One cause of death that was noticeably absent from the study was people crashing their cars while taking selfies. Let’s be real here for a second: this is obviously happening and is probably actually a major cause of selficide; it’s just not reported in the media. Using your phone in any capacity while driving increases the risk of something going wrong (which is why Apple and Google are adding features to make it easier to ignore your phone when you’re in the car). Trying to take a selfie while driving is just idiotic. It’s way too distracting and the photo won’t even be good. While some people were genuinely unfortunate—like these women who had a bridge collapse under them as they took selfies—more people died from taking risky selfies than not. There is nothing inherently wrong with taking risks but there is something wrong with taking stupid risks. 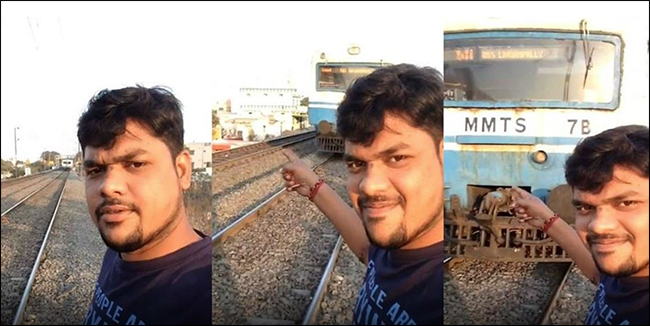 A significant number of the selfie incidents caused more than one death so people were doing more than just putting their own lives in danger. If, for any reason, you think taking a selfie could put you or other people at risk, then don’t do it. No photo is worth your life.